We can all agree that Anaconda’s are scary creatures; the size of them and the strength that they have within their enormous bodies is both intriguing and freaky. In Anaconda Eye Rapids, you get to explore South America with all its exotic creatures with a strong focus around the Anaconda. 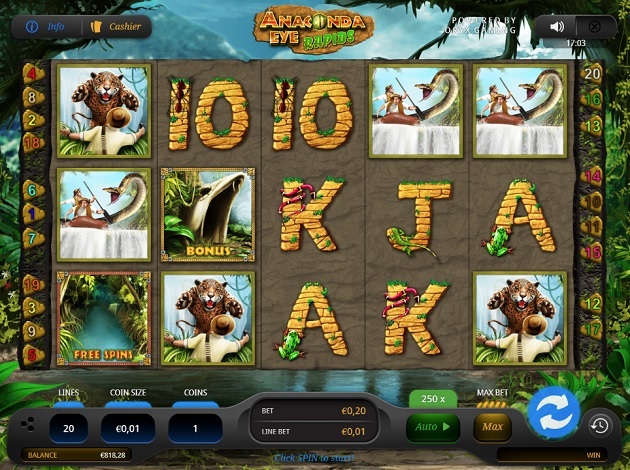 Anaconda Eye Rapids is a five reeled, three row slot with twenty paylines that takes you for a fun adventure through the jungle where you encounter some memorable and unusual circumstances. Fight off deadly animals and get some nice prizes in the process, can’t get more adventurous as well as beneficial than that, can it!? The RTP of Anaconda Eye Rapids is 96.08%. The minimum bet in Anaconda Eye Rapids is € 0.2 and the maximum bet is € 100. The wild symbol in this slot is beautifully designed and is represented by an eye of an Anaconda. The Anaconda eye wild symbol can substitute for all symbols except for the Anaconda cave and Risky Dive symbols. Aside from these special, triggering symbols you can expect to see a symbol with a pouncing jaguar, a snake strike and a crocodile attack. Then, lastly but certainly not least are the playing card symbols which all have some sort of small creature on it that can be found in the jungle like a frog, spider, lizard and more. Can you believe that there are around 30 species of Piranha’s in the lakes and rivers of South America today? Well, when you land three or more Risky Dive free spin symbols anywhere on the reels, you will be awarded with five free spins with x2 multiplier. In the murky, mysterious waters of the Amazon, you will then come face-to-face with five piranhas; three of them hiding additional free spins and two of them granting additional multipliers. The more Risky Dive free spin symbols you land, the more vicious piranhas you can pick. Hitting three Risky Dive symbols, you pick two piranhas, four Risky Dive symbols, you pick three piranhas and five Risky Dive symbols, you pick four piranhas. The Mystery Gates bonus feature is triggered when three, four or five Anaconda Cave bonus symbols appear repeatedly on an active payline, forming a bonus combination which can start on any reel. With three or more Anaconda cave symbols, you will enter the sacred cave with five mystery gates which lead to ancient shrines hidden throughout the jungle. You will then choose a gate to enter one of the shrines, each filled with treasure. You can return to the Anaconda cave two times to select a different gate, leading to another shrine! However, keep in mind that once you return to the cave, the prize collected in the shrine you just left will be lost. The highest paying symbol in Anaconda Eye Rapids is the anaconda eye wild which can reward you with up to a whopping 350x your total bet! The next highest paying symbol is the Jaguar Pounce which you can earn up to 20x your stake with. The snake strike can allow you to win up to 15x your stake and the Crocodile Attack can reward you with 10x your stake. The playing card symbols are the lowest paying symbols in this slot. The letter A can reward you with up to 5x your stake while the letter K and Q can reward up to 3.75x your stake. The lowest paying symbols are the J and 10 which can reward you up to 2.5x your stake. There isn’t a soundtrack playing in the background however, when you land on a winning combination or when you turn the reels, various sounds are played. When you do land on something special, expect the music to be jungle theme based with strong drum sounds! The graphics and animations of Anaconda Eye Rapid are minimalistic but that doesn’t mean that they aren’t detailed or appealing because they certainly are! The colour theme goes well with an amazon, jungle-based theme; lots of green, blue and yellow along with tiny hints of other colours. You see mountains, water and greenery faded in the background. The paytable can be found by clicking on the ‘info’ button in the top left corner. Anaconda Eye Rapid is a slot full of adventures one could expect while journeying through the amazon! Be prepared for sudden attacks from powerful animals and land some free spins that have a win multiplier in the process of doing so or trigger the Mystery Gate bonus feature to reveal some treasures hidden deep within the beautiful jungle. Keep your eyes peeled as you make your way through the amazon as you never know what can pop out to either attack you or to reward you! Go for an adventure with Anaconda Eye Rapids at Videoslots today! ORYX Gaming is a group of talented game experts who were ‘born to play’, as they like to describe themselves. ORYX Gaming is a multi-faceted company, not only producing their own slots, but doing much more than that by essentially developing a platform that does it all for operators. ORYX Gaming was founded back in 2010, with a very clear goal in mind. 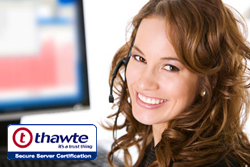 Their aim was to develop a solid platform that gaming operators can rely and depend on to distribute their games. This took two years to develop, but the final result was impressive, thanks to a team of experts from all disciplines. Although ORYX Gaming offers an impressively wide range of products and services, we’re mainly interested in the games they have to offer. ORYX Gaming offers a wide range of gaming products which include slot games, table and card games, video bingo, scratch card games, virtual sports, and even games with a live dealer. All of these are seamlessly integrated and optimised for desktop, mobile, and retail too. Their portfolio consists of more than 25 slot games, with a wide variety of themes. A lot of their slots tell a little story, with a detailed theme told through clever designs and features. They come up with particularly original bonus features which are sure to impress any player who appreciates a well-designed game. Check out ORYX Gaming’s Quick Slinger Bam Bam and Broker Bear Blast here at Videoslots!